Donate a New or Gently Used Backpack and SAVE! Feed My Starving Children Day at Raging Waves! Movie Night at Raging Waves! Thanks for surfing on by! Where can Fido and Fluffy go while you are at Raging Waves? Your Brock the Croc photo from the Taylor Swift concert! Located on Kookaburra Kreek (near the Great Barrier Reef Wave Pool). The Queen Cabanas include 5 chairs, table and 3 lounge chairs, daily treat, 8 bottles of water, fridge and wait staff service until 3pm. Only 1 form of payment allowed for wait service. 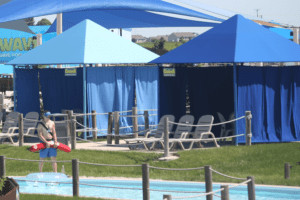 Queen cabanas can accommodate up to 8 guests, park admission is not included. Take a look inside a Queen Cabana!